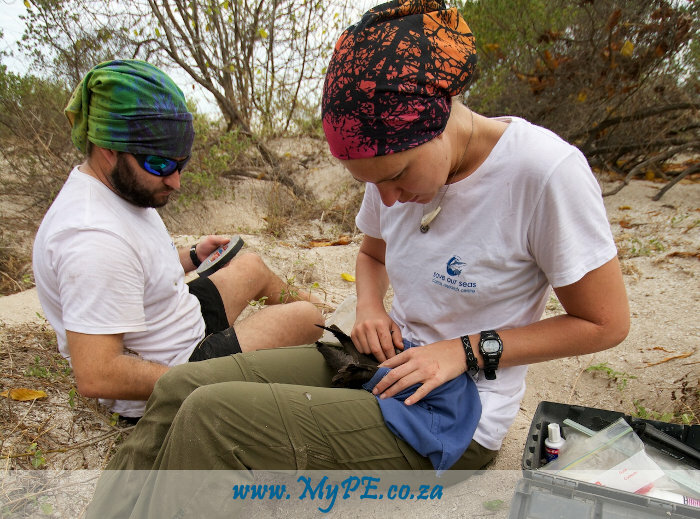 Van den Heever, 24, from Nelson Mandela Metropolitan University‘s Marine Apex Predator Research Unit (Mapru), studied the wedge-tailed shearwaters known as “ghost birds” because of their eerie call, at Reunion and Seychelles islands over the last three breeding seasons. She would conduct her fieldwork at night when they returned to their underground-burrow nests, after days at sea looking for food. The small size of the birds (they weigh between 250g and 350g) has in the past limited the technology scientists could use to track them, with most studies relying on nest or boat observation. But advances in technology have now led to light-weight tracking devices, weighing between eight and 12 grams, which can be attached to the shearwaters enabling scientists to track them out at sea – and this formed the crux of Van den Heever’s research. “I used special waterproof tape to attach a GPS to the tail feathers of the birds.” She also attached time depth recorders, to find how deep and for how long they would dive to catch fish. It was the first time these high-tech tracking devices had been fitted onto the shearwaters at Reunion, and only the second time at the Seychelles. From the Reunion data, she found that some of the birds flew as far as Madagascar – some 800km west of Reunion. “These long trips were to a very productive area [rich with fish], that is also favoured by boobies, terns and other tropical sea-birds. “At other times, they would visit a few spots just south-east of the island … These were upwelling areas [where nutrients are pushed up from the bottom of the sea] on the sea shelf, where there was lots of food available. She combined the tracking data she collected with her fieldwork, which included carrying out stable isotope analysis – a process which determines the carbon and nitrogen signature of the bird, through blood, feathers and diet samples. Van den Heever said her research in identifying the birds’ feeding hotspots would “hopefully contribute towards recommendations for the allocation of potential Marine Protected Areas in that area”. Globally, there are over five million wedge-tailed shearwaters – however research has shown that their numbers are dropping for several reasons, among them invasive species and overfishing – hence the need to monitor their behaviour at sea and protect their feeding grounds. She also conducted a census at the Seychelles, looking in over 700 burrows using an endoscope (a flexible tube with an attached camera) attached to a laptop. Van den Heever, whose research was supervised by NMMU senior zoology lecture and Mapru head Dr Pierre Pistorius, worked with the Save our Seas Foundation-D’Arros Research Centre (SOSF-DRC) at the Seychelles, and with the University of Reunion. Passionate about marine life since she was a young girl, she saved up her money at age 11 to pay for a scuba diving course, which sealed her decision to pursue ocean-focused work.